This was a really interesting read because it touches on something that is a major part of our world today, that is, the ability for anyone to see and interpret anything you put online, and attempts to piece apart the reactions and consequences of these actions. It was a very difficult book to read and I'm realizing, will be a very hard book to write a review for - and for that reason, I won't be giving it a star rating. I am back with another review, If You Don't Have Anything Nice to Say by Leila Sales. Thanks so much to Raincoast Books for sending me a copy of this book for an honest review, as always all opinions are my own. The book follows Winter, a National Spelling Bee champ who has the world at her (privileged) fingertips until she writes a racially inappropriate tweet as a joke. Many, however, don't see the humour in Winter's words and she becomes vilified for her actions, being called horrible names, having people say horrible things should happen to her. While she tries to make amends, she becomes alienated from one of her best friends and the future she so carefully built for herself comes crumbling down. I have a feeling this book will be quite controversial and, despite the fact that I was hooked by the premise, there were many times when I wanted to put it down because I was upset. This book takes a long, hard look at the so-called vigilante justice system that polices moral crimes of the internet - ruining peoples lives because of their actions. I think the book strikes up an important conversation about these inflicted punishments, discussing whether or not people are allowed to make mistakes and if that mistake should ruin their lives. 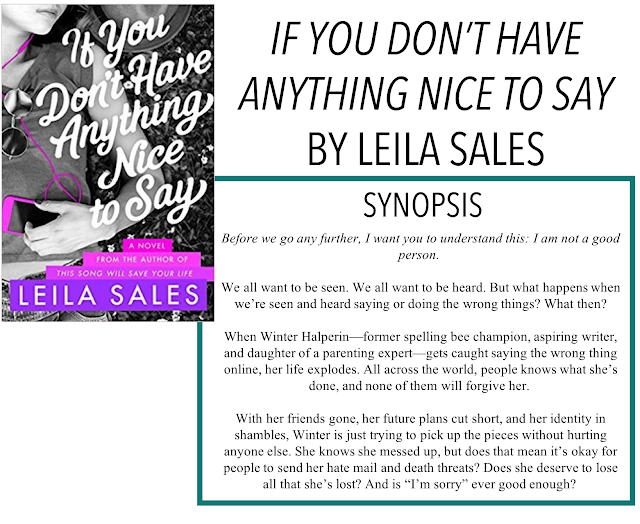 I think the book was well done, but my own conflicting feelings about the issue lead me to a place of indecisiveness on whether or not I liked it and agreed with Sales's portrayal of people like Winter. There was a lot of discussion about race (largely in part because of the nature of Winter's tweet) and I think it's an important element to the story, I just felt a little off-put by the way in which it was delivered. I'm not sure that this book was 100% needed and if this author was the best person to write a book like this - that focuses so intensely on the racial divisions so minutely ingrained in society, but it's out there now. And I suppose I should have listened to Winter's warning at the beginning of the book... that she is not a good person. It's an entirely new experience for me to read a book with a character like this and while I believe it is important to read many perspectives, I just feel a bit off-put by this one. I know it was trying to tackle a tough topic, I'm just not sure it fully stuck the landing. Overall, nothing in this book is easy and it may be seen as an important read that will force you to ask some tough questions, but I don't think it won't be without controversy.